To help us celebrate, you are invited to our beer drinking, pig roast blowout. This event will be off the chain! 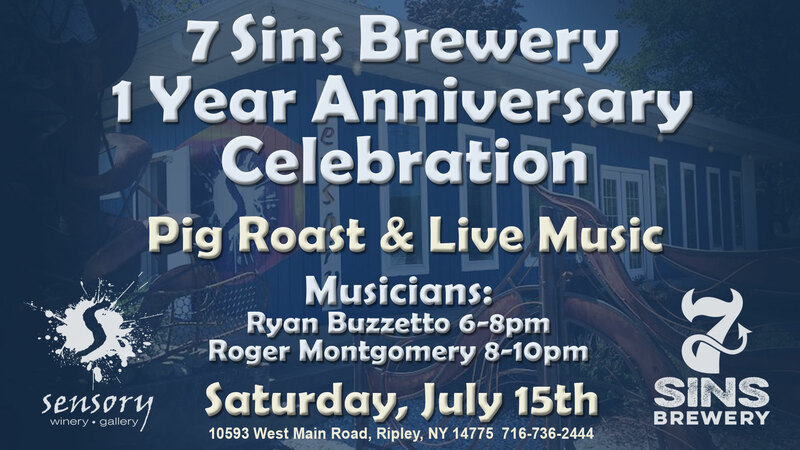 All 7 sins are on tap to go with a savory locally-sourced pig roast dinner (in fact, the hog is squealing in our back yard right now). Live music performances by two amazing local artists, too! Getting back to the sins, here is a quick look at our crafts. Envy – our Amber is to die for, an easy-drinking amber with a light nose and rich copper color, hits you at first, firing up your taste buds to start, and then…. finishes, just right! Pints are $4 all night long. Glasses of Sensory Winery wines are $4 too. In case you haven’t noticed, there are plenty of milestones for us to shout about, in just one short year! plus an indiscretion or two! also partners with Sensory Winery to host Open Mic and other live music events. We celebrated American Craft Beer Week, plus a whole lot more! 7 Sins Brewery is digital! We are all over social media including FaceBook, Instagram and Twitter. We deliver news via email and on our fresh website! Stick with us another year to see what else is in store! And watermelon to finish the meal. Enjoy live music from Ryan Buzzetto, singer songwriter on acoustic guitar. He is on stage at 6:00 p.m. and plays till 8:00 p.m. Check him out at https://www.youtube.com/watch?v=pJMVQzhsMUg. Roger Montgomery takes the stage at 8:00 p.m, and performs Blues, till 10:00 p.m. Listen to a snippet of Roger’s music at https://www.reverbnation.com/rodgerlmontgomery. We can’t wait! See you then.